It's a routine she began 20 years ago, as a way of dealing with grief over her husband's death. But what started out as therapy became something more. She found the joy of sharing her music with others not only therapeutic, but a lifesaver. 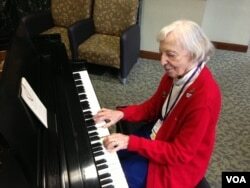 Rose has been playing piano since she was six years old. Mostly self-taught, she plays a variety of music, all from memory, and only has to hear a piece once to play it. 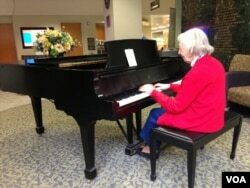 On this rainy day at the hospital, she plays popular tunes like "Memories," from the play Cats, and the theme song from the film Dr. Zhivago, and often pauses to ask visitors about their favorite tunes. She recalls a particular instance. It's that spirit of giving that has made Rose so popular. Marianne Monek, director of Sibley's volunteer program, is thrilled to have Rose at the hospital. “Her piano playing, her musical skills, it just brings so much joy to everyone, not only patients, not only family numbers, but staff." Laboratory manager Anita Mattero stops by regularly to hear Rose play. On a recent visit, she presented Rose with a gift -- a handmade purple shawl -- as a token of her appreciation. "I like to give to people who give to me," she explained. "There are times in the laboratory where I need to get away for a couple of minutes. I always let her pick a tune. Her smile and care for me as a human dissolves negativity and helps me get through my day... She’s an angel sent from heaven to watch over us and assure we are okay." Patient Sondra Snyder shared her warm feelings toward Rose on a recent visit to Sibley. Longtime volunteer Ann Ittner said everyone feels that way. "You come in here and it’s very cheerful music and she’s got quite a following. And when she’s not here on Friday, everybody comes over, ‘where’s Cerlene?’"
Rose said that after all these years, she’s glad she can still brighten everyone's day.